Specificity BLAST analysis of the peptide immunogen showed no homology with other human proteins, except ABCB6 (56â€¯% ). Immunogen HTR5A antibody was raised against a peptide located in the 1st extracellular domain of HTR5A (Human). Background The 5-HT5A Receptor is a member of the Serotonin Receptor subfamily. 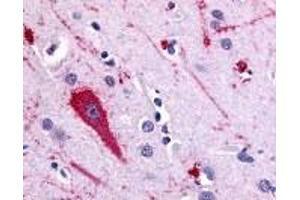 Application Notes HTR5A antibody can be used in immunohistochemistry starting at 20 μg/mL. Storage Comment HTR5A antibody should be stored long term (months) at -80 °C and short term (days) at 4 °C.